Keep the Serenity Prayer close to your heart with this inspirational necklace. 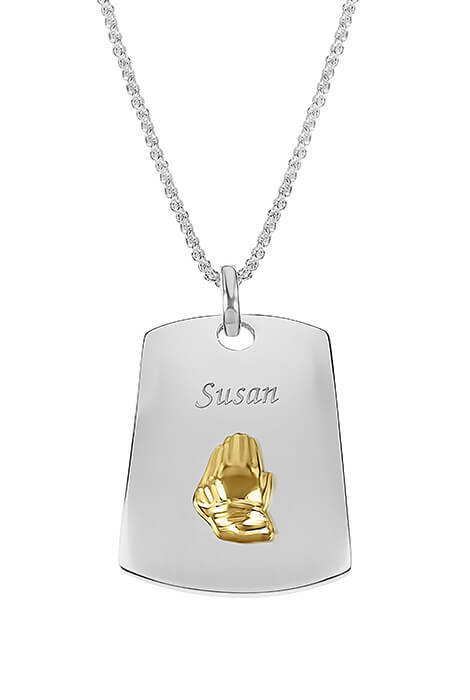 Shimmering silverplated dog tag style pendant features goldtone hands folded in prayer and space for 1 initial. The Serenity Prayer on the back reminds us to seek serenity, courage and wisdom. Makes a thoughtful gift! 1" wide x 1 1/2" high pendant includes a 23" long rope chain with lobster clasp and 3" extender. Specify name: 1 line, up to 9 letters/spaces. Base metal resists tarnishing. Allow 4–6 weeks for delivery.